One of the biggest challenges in Slovakia is to ensure systematic support for the development of decentralised, non-fossil and sustainable energy system. 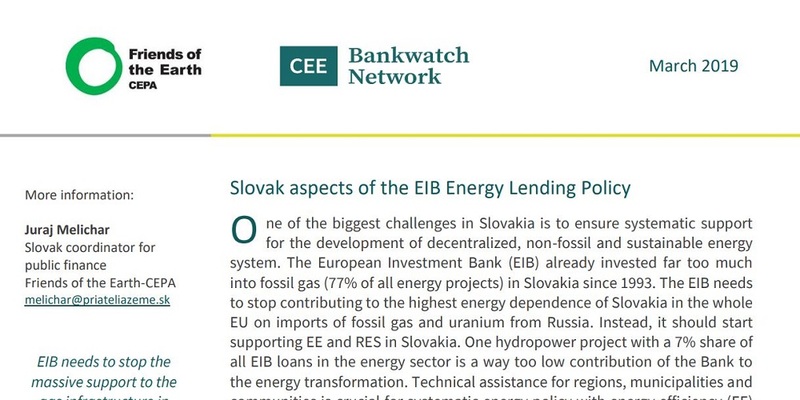 The European Investment Bank (EIB) already invested far too much into fossil gas (77 per cent of all energy projects) in Slovakia since 1993. The EIB needs to stop contributing to the highest energy dependence of Slovakia in the whole EU on imports of fossil gas and uranium from Russia. Instead, it should start supporting EE and RES in Slovakia. One hydropower project with a 7 per cent share of all EIB loans in the energy sector is a way too low contribution of the Bank to the energy transformation. Technical assistance for regions, municipalities and communities is crucial for systematic energy policy with energy efficiency (EE) and sustainable renewable energy sources (RES). EIB can build on the adopted and planned sustainability criteria for RES in Slovakia. EIB should refrain from supporting waste incineration in Slovakia due to recycling rates below the binding targets for the circular economy. Given the fact that the EIB already supported massively the gas and coal infrastructure (85 per cent of the overall energy financing), the new supported power generation needs to reach an average of 100 g CO2/kWh.